The New Year brings epic adventures for Adult Swim's new animated series, Tigtone, premiering Sunday, January 13th at Midnight ET/PT. This quarter-hour series is created by Andrew Koehler and Benjamin Martian, who also serve as executive producers with Blake Anderson (Workaholics). Tigtone is the saga of a quest-addicted hero (Tigtone) who slashes his way through a satirical fantasy universe with melodramatic ferocity and a complete disregard for the collateral damage he inflicts along the way. The series both celebrates and subverts tropes of the fantasy genre, role playing games, video games, and films. Combining highly rendered, hand-painted fantasy art, motion capture performance, 2D animation, and pseudo-3D visual effects, the wizards at Titmouse have ventured into uncharted territory to pioneer this radical new style, creating a Tigtone universe that is beautifully unsettling. 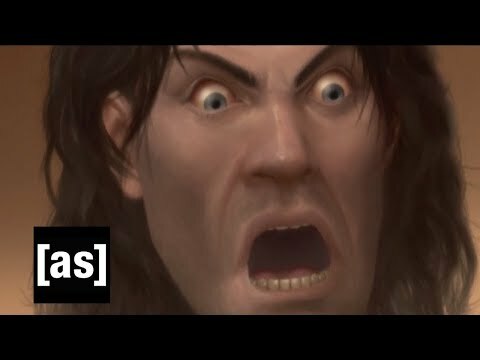 Tigtone Season 1 was released on Adult Swim 99d ago in the US.